Controls the location and appearance of legends on two-dimensional plots, contour plots, maps, and charts. specifies the number of columns to use for legend entries. generates and colors a three-dimensional block effect behind the legend. draws a colored frame around the legend. specifies the background color of the legend. generates and colors a drop shadow behind the legend. specifies the number of rows to use for legend entries. draws a frame around the legend. specifies the thickness of the frame, where thickness-factor is a number. specifies how many times the plot symbol is repeated in the legend. specifies the arrangement of legend entries when there are multiple rows and multiple columns. specifies the amount of space between individual legend values along a horizontal baseline. specifies whether the legend is drawn in the procedure output area or whether legend elements can overlay other graphics elements. specifies the distance to move the entire legend. specifies the x and y coordinates of the lower left corner of the legend box. positions the legend on the graph. selects or orders the legend values that appear in the legend. specifies one or more characters that the LEGEND statement uses to break a text description string into multiple lines. modifies the legend value descriptions. specifies the number of columns to use for legend entries. If there are multiple rows and columns in a legend, use the ROWMAJOR and COLMAJOR options to specify the arrangement of legend entries. Specify the ROWMAJOR option to arrange entries (from lowest to highest) starting from left to right, and then top to bottom. Specify the COLMAJOR option to arrange entries starting from top to bottom, and then left to right. generates and colors a three-dimensional block effect behind the legend. The size and position of the block are controlled by the graphics option OFFSHADOW=(x,y).. The Java applet treats the CBLOCK option like the CSHADOW option. The CBLOCK= and CSHADOW= options are mutually exclusive. If both are present, SAS/GRAPH software uses the last one specified. Interaction:The CBLOCK= option is usually used in conjunction with the FRAME, CFRAME=, or CBORDER= options. Restriction: This option overrides the FRAME option. Interaction: CBORDER= can be used in conjunction with the CFRAME= option. specifies the background color of the legend. This option overrides the FRAME option. Restriction:If both the CFRAME= and FRAME= options are specified, only the solid background produced by the CFRAME= option is displayed. Interaction: The CFRAME= option can be used in conjunction with the CBORDER= option. generates and colors a drop shadow behind the legend. The size and position of the shadow is controlled by the graphics option OFFSHADOW=(x,y). Restriction:The CSHADOW= and CBLOCK= options are mutually exclusive. If both are present, SAS/GRAPH uses the last one specified. Interaction: The CSHADOW= option is usually specified in conjunction with the FRAME, CFRAME=, or CBORDER= options. specifies the number of rows to use for legend entries. If there are multiple rows and columns in a legend, use the ROWMAJOR and COLMAJOR options to specify the arrangement of legend entries. Specify the ROWMAJOR option to arrange entries (from lowest to highest) starting from left to right, and then top to bottom. Specify the COLMAJOR option to arrange entries starting from top to bottom, and then left to right. draws a frame around the legend. The color of the frame is the first color in the color list. NOFRAME suppresses the drawing of a frame, and is the default. specifies the thickness of the frame, where thickness-factor is a number. The thickness of the line increases directly with thickness-factor. By default, FWIDTH=1. provides up to 256 characters of label text. Enclose each string in quotation marks. Separate multiple strings with blanks. Note:A BY variable name displayed is always in uppercase. If a label is used, it appears as specified in the LABEL statement. See Text Description Suboptions for complete descriptions of these suboptions. .
#BYVAL or #BYVAR substitution in a text string is not available in the DATA Step Graphics Interface or in the Annotate facility. The reason is that BY lines are not created in a DATA step. Note:The Java applet does not support the POSITION= suboption—it draws legend labels at the top left of the legend. Also, it does not support multiple values for the JUSTIFY= suboption (only the first is honored). The ActiveX control supports the POSITION= option but does not support multiple values for the JUSTIFY suboption (only the first is honored). takes space for the legend from the procedure output area, thereby reducing the amount of space available for the graph. If MODE=RESERVE is specified in conjunction with OFFSET=, the legend can push the graph off the graphics output area. RESERVE is valid only when POSITION=OUTSIDE. If POSITION=INSIDE is specified, a warning is issued and MODE= value is changed to PROTECT. draws the legend in the procedure output area. If the legend is positioned over elements of the graph itself, both graphics elements and legend elements are displayed. By default, MODE=RESERVE unless POSITION=INSIDE. In this case, the default changes to MODE=PROTECT. If the MODE=PROTECT option is used with labels on the midpoint axis, the axis labels might overlap the legend. In that case, if a device-resident font is used as the label font, the device-resident font for each label that overlaps the legend is replaced with a SAS/GRAPH font. 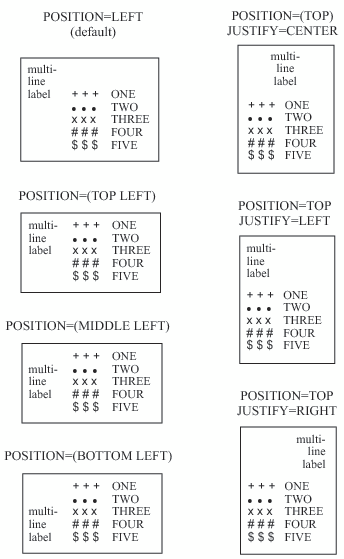 This includes the axis label and the tick mark labels. Since device-resident fonts do not support clipping, a SAS/GRAPH font must be substituted in that case. To correct an overlap condition, you can use the LABEL=NONE and VALUE=NONE options on your midpoint axis statement to suppress the axis labels. Another choice is to use the positioning options on your LEGEND statement to reposition the legend. specifies the distance to move the entire legend. x is the number of units to move the legend right (positive numbers) or left (negative numbers). y is the number of units to move the legend up (positive numbers) or down (negative numbers). The OFFSET= option is usually used in conjunction with the POSITION= option to adjust the position of the legend. Moves are relative to the location specified by the POSITION= option, with OFFSET=(0,0) representing the initial position. You can also apply the OFFSET= option to the default legend position. The OFFSET= option is unnecessary with the ORIGIN= option since the ORIGIN= option explicitly positions the legend and requires no further adjustment. However, if you specify both options, the OFFSET= values are added to the ORIGIN= values, and the LEGEND is positioned accordingly. If a character variable has an associated format, the specified values must be the formatted values. For a complete description of value-list, see the ORDER= option in the AXIS Statement. Even though the ORDER= option controls whether a legend value is displayed and where it appears, the VALUE= option controls the text that the legend value displays. Up to 256 characters in a variable value might be displayed. specifies the x and y coordinates of the lower left corner of the legend box. The ORIGIN= option explicitly positions the legend anywhere on the graphics output area. It is possible to run a legend off the page or overlay the graph. The ORIGIN= option overrides the POSITION= option if both are used. Although using the OFFSET= option with the ORIGIN= option is unnecessary, if the OFFSET= option is also specified, it is applied after the ORIGIN= request has been processed. specifies the location of the legend in relation to the axis area. By default, POSITION=(BOTTOM CENTER OUTSIDE). You can change one or more settings. If you supply only one value the parentheses are not required. If you specify two or three values and omit the parentheses, SAS/GRAPH accepts the first value and ignores the others. Once you assign the initial legend position, you can adjust it with the OFFSET= option. The ORIGIN= option overrides the POSITION= option. The value of the MODE= option can affect the behavior of the POSITION= option. Note:The Java applet defaults to BOTTOM-CENTER and supports all possible combinations of BOTTOM | MIDDLE | TOP with LEFT | CENTER | RIGHT except for MIDDLE-CENTER (which would overwrite the map.) The Java applet does not support INSIDE. specifies how many times the plot symbol is repeated in the legend. Valid values are 1 to 3. The default value is 3 .
specifies the arrangement of legend entries when there are multiple rows and multiple columns. Specify the ROWMAJOR option (the default) to arrange entries (from lowest to highest) starting from left to right, and then top to bottom. Specify the COLMAJOR option to arrange the entries starting from top to bottom, and then left to right. specifies the size and shape of the legend values displayed in each legend entry The SHAPE= value that you specify depends on which procedure generates the legend. is used with the GCHART and GMAP procedures, with the GPLOT procedure if you use the AREAS= option, and with the GCONTOUR procedure if you use the PATTERN option. Each legend value is a bar of the specified width and height. By default, width is 5, height is 0.8, and units are CELLS. You can specify units for the width,height pair or for the individual coordinates. is used with the GPLOT and GCONTOUR procedures. Each legend value is a line of the length that you specify. Plotting symbols are omitted from the legend values. By default, length is 5 and units are CELLS. You can specify units for length. By default, width is 5, height is 1, and units are CELLS. You can specify units for the width,height pair or for the individual coordinates. specifies the amount of space between individual legend values along a horizontal baseline. Value-spacing can be any nonnegative number, including decimal values. Units are only character cells. You cannot specify a unit of measure, such as inches or percent. The LEGEND statement calculates spacing based on the available display area, and the number and width of legend entries. If the spacing requested exceeds the display area, the legend values and their descriptions are rearranged to fit. The specified spacing is requested in conjunction with vertically stacked columns. If the LEGEND statement does not encounter a specified split character, no break in the text occurs, and no warning or error is issued. Up to 31 split characters are supported. If you specify more than 31 characters, only the first 31 are honored. Note: The split characters themselves are not displayed. modifies the legend value descriptions. Text-argument(s) defines the appearance or the text of the value descriptions. By default, value descriptions are the values of the variable that generates the legend or an associated format value. Numeric values are right-justified and character values are left-justified. provides up to 256 characters of text for the value description. Enclose each string in quotation marks. Separate multiple strings with blanks. Value description text that is too long to fit in a legend area can result in the entire value not being displayed. Place text description suboptions before the text strings that they modify. Suboptions not followed by a text string affect the default values. To specify and describe the text for individual values or to produce multi-line text, use the TICK= suboption. To order or select legend entries, use the ORDER= option. specifies the angle of the legend label or legend value description text with respect to the horizontal. A positive value for degrees moves the text counterclockwise; a negative value moves it clockwise. By default, ANGLE=0 (horizontal). Note: Some settings of ANGLE= in the LEGEND statement might result in undesirable text positioning. specifies the alignment of the text. The default for character variables is JUSTIFY=LEFT. The default for numeric variables is JUSTIFY=RIGHT. Associating a character format with a numeric variable does not change the default justification of the variable. Place text description suboptions before the text strings that they modify. places the legend label in relation to the legend entries. The POSITION= suboption is used only with the LABEL= option. By default, POSITION=LEFT. The parentheses are not required if only one value is supplied. If you specify two or three values and omit the parentheses, SAS/GRAPH accepts the first value and ignores the others. In this specification, the POSITION= suboption specifies the default value, LEFT, which is represented by the first legend in the figure. The POSITION= value is indicated above each legend. The default justification is used unless you also use the JUSTIFY= suboption. In addition, specifying POSITION=RIGHT mirrors the effect of POSITION=LEFT, and specifying POSITION=BOTTOM mirrors the effect of POSITION=TOP. specifies the angle at which each character of text is rotated with respect to the baseline of the text string. A positive value for degree rotates the character counterclockwise; a negative value moves it clockwise. By default, ROTATE=0 (parallel to the baseline). Note: Some settings of ROTATE= in the LEGEND statement might result in undesirable text positioning. The characteristics of all other value descriptions remain unchanged. If you omitted TICK=3, the text of the second legend entry would be ParisSydney. The text of all three entries would use the Swiss font; the first and third entries would be red and only the second entry would be blue. LEGEND definitions are not automatically applied when a procedure generates a legend. Instead, they must be explicitly assigned with a LEGEND= option in the appropriate procedure statement. The following figure illustrates the terms associated with the various parts of a legend. FONT=ALBANY applies to both Weight and (in tons). HEIGHT=4 affects Weight, but is respecified as HEIGHT=3 for (in tons). JUSTIFY=RIGHT affects only (in tons). LEGEND statements can be located anywhere in your SAS program. They are global and remain in effect until canceled or until you end your SAS session. LEGEND statements are not applied automatically, and must be explicitly assigned by an option in the procedure that uses them. You can define up to 99 different LEGEND statements. If you define two LEGEND statements of the same number, the most recently defined statement replaces the previously defined statement of the same number. A LEGEND statement without a number is treated as a LEGEND1 statement. Specifying RESET=GLOBAL or RESET=ALL cancels all current LEGEND definitions as well as other settings. By default, the legend shares the procedure output area with the procedure output, such as a map or bar chart. See How Graphics Elements Are Placed in the Graphics Output Area. However, several LEGEND statement options enable you to position a legend anywhere on the graphics output area and even to overlay the procedure output. This section describes these options and their effect on each other. Describe the general location of the legend with the POSITION= option. If necessary, fine-tune the position with the OFFSET= option. Position the legend explicitly with the ORIGIN=option. OUTSIDE and INSIDE determine whether the legend is located outside or inside the axis area. BOTTOM or MIDDLE or TOP (vertical position) and LEFT or CENTER or RIGHT (horizontal position) determine where the legend is located in relation to its OUTSIDE or INSIDE position. Legend Positions inside the Axis Area shows the legend positions inside the axis area. Legend Positions outside the Axis Area shows legend positions outside the axis area. The default combination is POSITION=(BOTTOM CENTER OUTSIDE). The combination (OUTSIDE MIDDLE CENTER) is not valid. Use OFFSET=(x,y) to adjust the position of the legend specified by the POSITION= option. The x value shifts the legend either left or right and the y value shifts the legend either up or down. The offset values are always applied after the POSITION= request. For example, if POSITION=(TOP RIGHT OUTSIDE), the legend is located in the upper right corner of the graphics output area. If OFFSET=(0,0) is specified, the legend does not move. If OFFSET=(–5,–8)CM, the legend moves 5 centimeters to the left and 8 centimeters down. Use ORIGIN=(x,y) to specify the coordinates of the exact location of the lower left corner of the legend box. Because ORIGIN=(0,0) is the lower left corner of the graphics output area, the values of x and y must be positive. If you specify negative values, a warning is issued and the default value is used. RESERVE reserve space for the legend outside the axis area and move the graph to make room for the legend. This is the default setting and is valid only when POSITION=OUTSIDE. PROTECT prevents the legend from being overwritten by the procedure output. PROTECT blanks out graphics elements, allowing only legend elements to be displayed in the legend's space. SHARE displays both graphics elements and legend elements in the same space. This setting is usually used when the legend is positioned inside the axis area. SHARE is useful when the graph has a space that the legend can fit into. You cannot specify both POSITION=INSIDE and MODE=RESERVE because MODE=RESERVE assumes that the legend is outside the axis area, and POSITION=INSIDE positions the legend inside the axis area. Therefore, when you specify POSITION=INSIDE, change the value of the MODE= option to SHARE or PROTECT. Otherwise, SAS/GRAPH issues a warning and automatically changes the MODE= value to PROTECT. To produce a drop shadow or a three-dimensional block effect behind the legend use the CSHADOW= or CBLOCK= option in the LEGEND statement in conjunction with the graphics option OFFSHADOW=(x,y). The value of x determines how far the shadow or block extends to the right (positive numbers) or to the left (negative numbers) of the legend. The value of y determines how far the shadow or block extends above (positive numbers) or below (negative numbers) the legend. If OFFSHADOW=(0,0) is specified, the shadow or block is not visible. By default, OFFSHADOW=(0.0625, -0.0625) IN. That is, the shadow or block extends 1/16th of an inch to the right and 1/16th of an inch below the legend. The BY statement produces a BY line that contains the variable name and its value. If you specify the variable name, options are available to substitute the variable name and its value in text strings. To use the #BYVAR and #BYVAL options, insert the option in the text string at the position you want the substitution text to appear. Both #BYVAR and #BYVAL specifications must be followed by a delimiting character, either a space or other nonalphanumeric character, such as the quotation mark that ends the text string. If not, the specification is completely ignored and its text remains intact and is displayed with the rest of the string. To allow a #BYVAR or #BYVAL substitution to be followed immediately by other text, with no delimiter, use a trailing dot (as with macro variables). The trailing dot is not displayed in the resolved text. If you want a period to be displayed as the last character in the resolved text, use two dots after the #BYVAR or #BYVAL substitution. The BY statement does not name the variable specified by #BYVAL or #BYVAR. For example, #BYVAL2 when there is only one BY variable or #BYVAL(ABC) when ABC is not a BY variable or does not exist. There is no BY statement at all. No error or warning message is issued and the option specification is displayed with the rest of the string. The graph continues to display a BY line at the top of the page unless you suppress it by using the NOBYLINE option in an OPTION statement. For more information, see the BY Statement.